I'm home from work with the flu. My coughing and sneezing are too much for my dogs, who have disappeared under the bed, leaving me alone to binge watch The Leftovers, whose characters live in a world after a Rapture-like event caused many people to vanish. I can't tell if I'm running a fever or if this TV series, based on Tom Perrotta's novel of the same name, is just downright weird. I'll see if I can collect my thoughts enough to tell you about a couple of books whose characters have their hands full sans a mass disappearance. 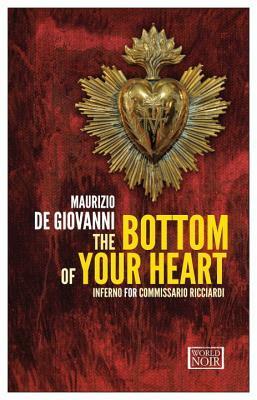 A man who's falling from his fifth-floor window windmills his way to the ground in the opening of Maurizio de Giovanni's The Bottom of Your Heart: Inferno for Commissario Ricciardi (translated from the Italian by Antony Shugaar; Europa Editions, November 2015). It's a beautiful piece of descriptive writing in a book replete with lively descriptions of life in the sweltering summer of 1939 Italy under Mussolini. The point of view leaps among various short first-person narrations, but it focuses primarily on a third-person omniscient narrator's account of the investigation of Commissario Luigi Ricciardi and Brigadier Raffaele Maione into the death of Professor Tullio Iovine del Castello, chair of gynecology at a university hospital in Naples. There is no shortage of suspects if Dr. Iovine was pushed or thrown; the victim repeatedly flunked an old professional rival's son in his medical school classes, was having an extramarital affair with a woman young enough to be his daughter, and had enraged a ferocious gangster who swore revenge. The Botom of Your Heart is the seventh book in this series, and characters from previous books reappear. Ricciardi, who fears for his sanity and keeps himself aloof since "the Deed" that allows him to hear the final thoughts and to see the ghostly shades of people who have died by violence (see Maltese Condor's review here), is still single in his 30s and is living with his beloved tata, now in deteriorating health, and her niece, Nelide. 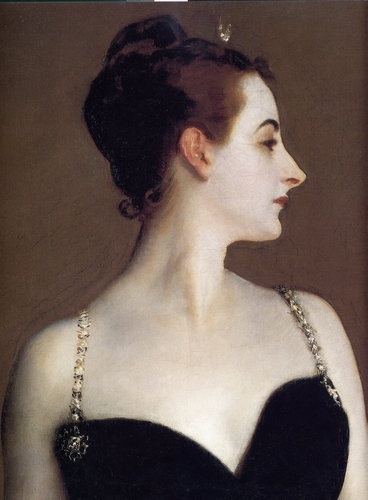 The lonely Commissario also has the affections of Enrica, the shy teacher who lives with her family across the street; Livia Vezzi, a beautiful social butterfly and widow of Italy's most famous tenor; Dr. Modo, the irascible medical examiner; and, of course, his loyal and tireless Brigadier, whose own secrets make him particularly impatient with his informant, Bambinella, a transvestite prostitute. This entertaining series is for people who enjoy crime fiction with a literary bent, keeping track of an ensemble cast of characters, and an Italian setting that's brought to life by its characters' concerns and the author's vivid writing. A reader can begin anywhere in this series, but for the full backstory, start with the first book, I Will Have Vengeance: The Winter of Commissario Ricciardi. The Italians in de Giovanni's series are natural philosophers. 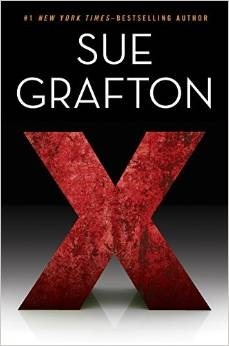 Even sassy private eye Kinsey Millhone is becoming more reflective in Sue Grafton's X (Marian Wood Books/Putnam, August 2015), the 24th book in the alphabet series set in the fictional town of Santa Teresa, California. Unlike other titles in the series (see my review of W Is for Wasted here), this "X" doesn't specifically stand for anything; however, one can find all sorts of Xs (symbolic and real), in the book: Teddy Xanakis, kisses, ex-husbands and wives, mistakes, the missing, a place locator, and unknowns. In reading X, one gets the sense that things are beginning to wind up for Kinsey. The woman who trims her own hair with a fingernail scissors and has one dress hanging in her closet is financially secure, at least for a while; she can pick and choose her cases. Kinsey agrees to find an ex-con just released from prison only when Hallie Bettancourt says she was referred by one of Kinsey's friends, and Kinsey becomes involved in Pete Wolinsky's old case only when his widow, Ruthie, asks for help in locating financial records for an IRS audit. This isn't one of Grafton's strongest books; the plot feels somewhat contrived, and I was at times annoyed by Grafton's excessive attention to detail (Kinsey doesn't just make coffee, she turns on the machine, adds the coffee, watches the water heat...). Still, it's worthwhile to revisit Santa Teresa to see how one of mysterydom's most likable female sleuths is doing, and we won't have many more chances. Grafton does a great job of conveying what it's like to live on California's Central Coast; here, in 1989. Kinsey still goes to the library to look for old records and composes her case summaries on a Smith & Corona typewriter. She and her 89-year-old landlord and neighbor, Henry, are dealing with some new neighbors and the drought. (Was this timely reading!) In this 24th book, Kinsey seems less inclined to get into trouble, but when the searches for the ex-con and the financial records open cans of worms, she can't help but start digging. By the end, she's learned a thing or two and made her peace with the fact that justice isn't always cut-and-dried. I could swear I was reading a few weeks ago about some OTHER book that starts with a guy's thoughts as he plummets out a window. But now I can't think of the title. Grrr. Well, Sister Mary, I hope you let us know if you do think of that other title. I'd be very interested to know. The contrast between the sensuous thoughts of de Giovanni's falling man and his looming appointment with the ground had me in a cringing swoon. The fall took something like five pages! Another book that opens with a fall is Michael Gruber's Valley of Bones, but the focus of that opening scene is the cop who witnessed it, well, okay, KINDA witnessed it: "The cop happened to look up at just the right instant or he would have missed it, not the actual impalement [onto the fleur-de-lis spearheads of the Trianon Hotel's fence], but the fall itself. It took him a disorienting second to realize what he was seeing, the swelling black mass against the white stone and glass of the hotel facade, and then it was finished, with a sound that he knew he would carry to his grave." I enjoyed this book, too. Well, I still haven't thought of that book, but the main thing is, I hope you're feeling better.